This highly significant film was only the fourth in German film-making history to be made in colour, and includes a fantastic array of special effects. 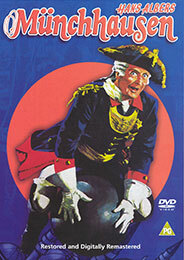 Münchhausen is an outstanding example of Third Reich cinema at its most extravagant. Arguably director Josef von Báky’s most controversial piece, Münchhausen was commissioned by Propaganda Minister Joseph Goebbels to commemorate the 25th anniversary of the greatest German film studio, UFA. Assigning a massive five-million-Reichsmark budget to the making of this epic tale of the legendary Baron Münchhausen, Goebbels wanted to ensure the film emulated and surpassed the best Hollywood had to offer, and in so doing the film became the biggest entertainment project of the Third Reich. With a highly impressive cast headed by Hans Albers, the most popular German film actor of his generation, Münchhausen began pre-production in 1941 and was premiered on 5 March 1943 at Berlin’s prestigious Ufa-Palast am Zoo. An instant and huge critical and popular success, this restored and digitally remastered DVD release is destined to continue in the same tradition. Set in eighteenth century Venice, Münchhausen tells the story of The Baron von Münchhausen and his extravagant adventures. Accompanied by his servant Kuchenreutter, Münchhausen endures a journey entailing romance, war, capture, imprisonment, escape and ultimately death. However, during this time the audience enjoys numerous stories that Münchhausen is only too willing to tell. Known for his sensationalism, he manages to entertain the Sultan during his imprisonment, which leads to the freedom of the Princess and his own escape.